Kayley and Christian are two of the most genuine and kind people we have ever met! Seeing the love that these two had for not only each other, but also their family and friends was so special. This wedding was a little extra fun for Amber as well, who used to work with Kayley! Guests could really feel the love and amount of thought that the couple put into all of their wedding details. The scenic Waldenwoods Resort served as their ceremony and reception venue for their September 8th wedding, which ended up being perfectly overcast and 70 degrees! Kayley and Christian were drawn to this venue, because of it’s classic and historical look. Lush rose petals led the way down the aisle to the stunning floral installation on the pergola by Violet Rose Floral, where they would soon be married. 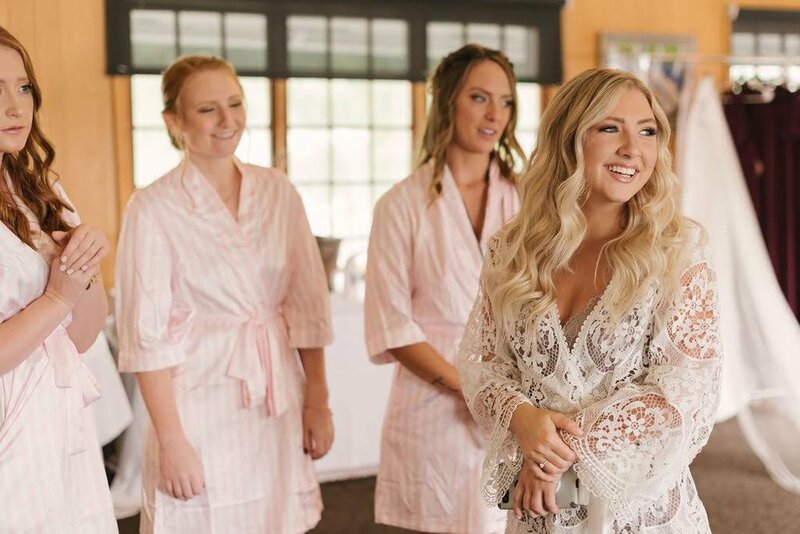 The classic and elegant sounds of Horizon Strings, Inc. ushered the bridal party down the aisle where Kayley’s grandfather officiated their heartfelt ceremony. Following the ceremony, guests enjoyed passed appetizers and drinks on the back lawn with a unique vintage furniture lounge provided by Ruby Slipper Design. Inside the Cromaine Lodge at Waldenwoods, tables were decorated with ivory satin linens, creatively folded blush satin napkins, lush floral compote centerpieces alternating with candle collections. 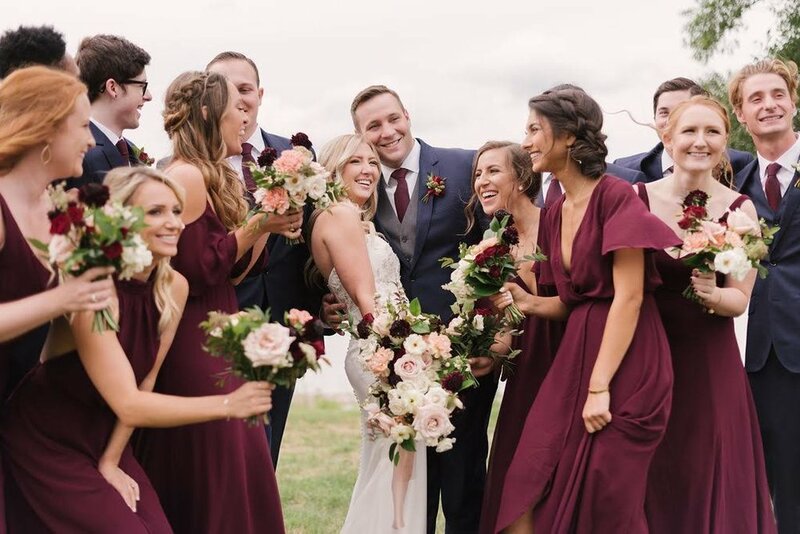 The floral palette for their wedding was the perfect introduction into fall with burgundy, blush, greenery and full of texture. Kayley and Christian were all about letting their guests see their fun side too! These two came dancing into their reception to the theme song from Top Gun, decked to the nines! Kayley also surprised Christian with a creative baseball groom’s cake and wedding cake made by Patisserie Angelica, who is located near Kayley’s hometown in California. Kayley’s parents (who still reside in California) had wine shipped out from a family friend’s vineyard to provide a little taste of home! Guests also enjoyed delectable mini cupcakes from Love & Buttercream, a s’mores station while using ShutterBooth - Southeast Michigan throughout the evening. Mary Ann Productions kept the dance floor packed all night with the perfect mix for this fabulous couple and their friends. The evening was capped off with a thank you speech from the groom and sparkler exit! Congratulations Kayley and Christian, we loved every minute of working with you and your wedding day! Photography by Field Gems Photography. It was the perfect September day and the scenery did not disappoint! The perfect flatlay with just the right touch of details and greenery for Kayley and Christian’s invitation. Eagerly awaiting getting into her wedding dress! Kayley is such a beautiful, light-hearted soul! 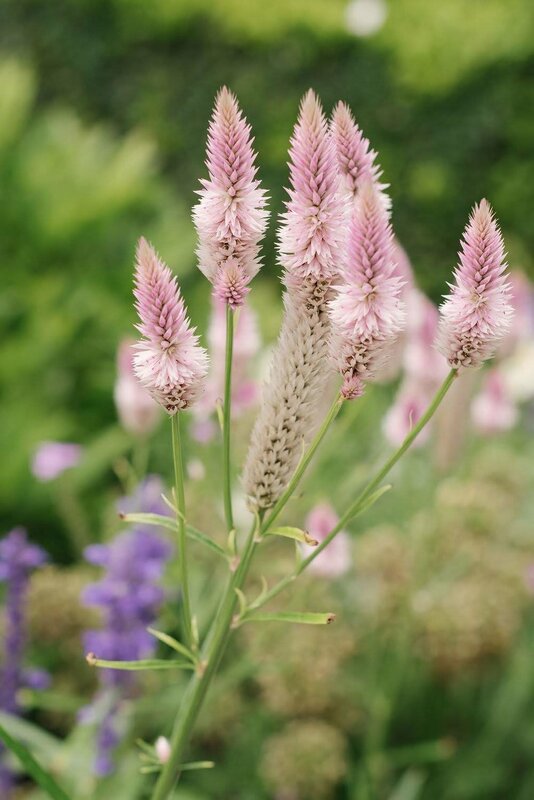 This bouquet deserves a second look! Enjoying some time to unwind with drinks, shuffle board and pool before the ceremony! Christian and his groomsmen looked so handsome in their navy suits with burgundy accents. Cue the feels! We love “father first looks,” such a special moment for Kayley and her parents! Waiting to see his gorgeous bride! 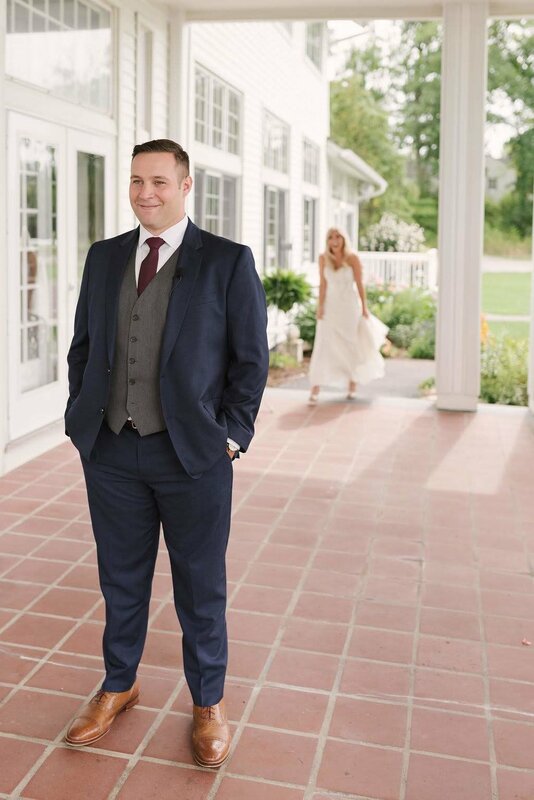 The bridal veil may be the best third wheel out there! This group had so much fun together! A stunner of a floral installation by Violet Rose Floral. 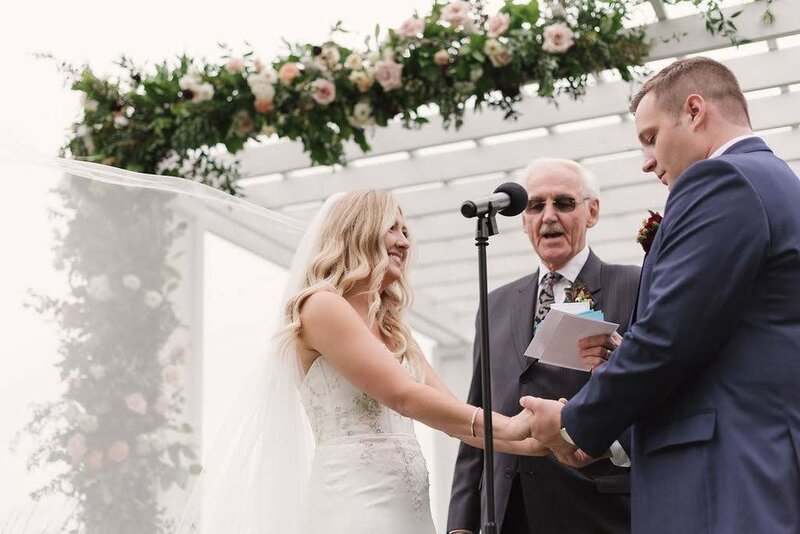 The ceremony had an extra personal touch because it was officiated by Kayley’s grandfather! Guests enjoyed snapping a candid pic and sharing a thoughtful message with the bride and groom. Just the right touch for Kayley and Christian’s sweetheart table. Pillar candles, votive candles and bud vases scattered around the room added a warm candlelit glow. Lush, textured floral arrangements featured a color palette of blush, mauve, burgundy, ivory and greens. Kayley surprised Christian with a baseball groom’s cake! A sweet ending to the night with a s’mores bar for guests to enjoy! The perfect ending to such a magical day! Enjoy their wedding trailer by Bella Reel! So much love for all of these vendors! Vendor A-Team: Photography: Field Gems Photography, Cinema: Bella Reel, DJ: Mary Ann Productions, Floral: Violet Rose Floral, Ceremony and Reception Venue: Waldenwoods Banquet & Conference Center, Cupcakes: Love & Buttercream, Wedding Cake: Patisserie Angelica, Transportation: Getaway Charters, Hair and Makeup: Paul Mitchell the Salon, Photo booth: ShutterBooth - Southeast Michigan, Rentals: Ruby Slipper Design, Linens: Special Occasions East Inc., Ceremony Music: Horizon Strings, Inc. Wedding Dress: Joy Abendmode Bridal Boutique. Wedding Planner: Pineapple Punch Events.